There seems to be an assumption from various development team members, including project managers, financiers, and designers, that the developer contracts directly with the modular unit fabricator. However, as the modular design and construction method is different from a site-built method, the perspective on what gets procured and delivered in construction differs, as well. 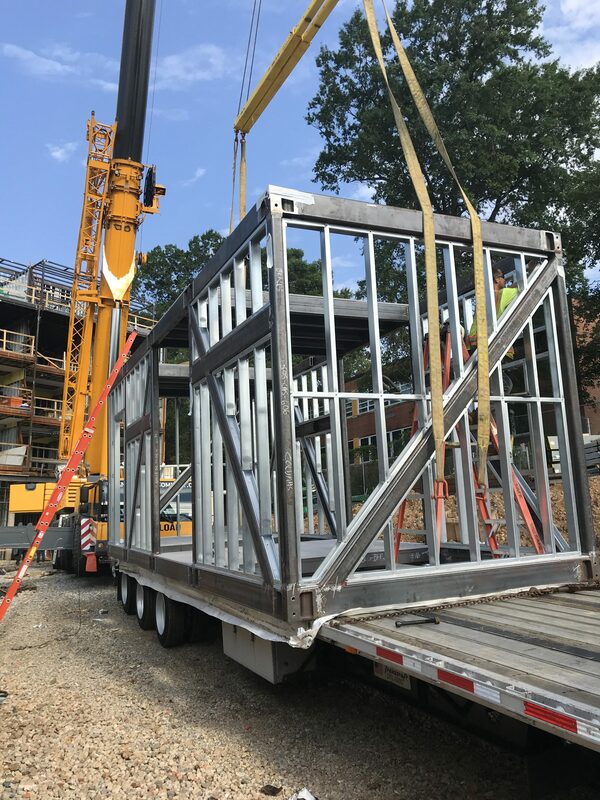 The developer should think of the module, the unit, as an element that is purchased and delivered to the site for installation by the general contractor and is overseen by a site supervisor representing the modular fabricator to address issues during modular unit delivery and setting that may arise at the site. The module can be considered like a cabinet that is constructed in a factory, delivered to the site, and ready to be installed. As such, similar risks in production, transportation, availability, quality, etc. are a concern, and, like a cabinet, it is the general contractor that contracts for the purchase, delivery, and installation of the cabinet. However, if something goes wrong with a cabinet, the budget and schedule impacts may not be as devastating as a modular unit. Therefore, the coordination between the architect, fabricator, and general contractor (GC) is critical from the very beginning of the design process. The GC should recommend potential modular unit fabricators and work closely with the developer in identifying the qualified fabricator with capacity. Because the fabricator is critical to the design of the project, they should be identified early so that the fabricator’s design engineer informs the design of the building at the initial Concept and Schematic Design phase. Finally, a key factor in modular construction and achieving more exact pricing, scheduling, and efficiencies is agreeing on building plans and unit finishes during the schematic design phase. Agreeing upfront on these core design elements provides opportunities to focus on modular design methods that will reduce construction time and potentially costs, particularly related to coordinating on-site construction and off-site fabrication. In our next blog, we will look at the rules of thumb to follow when planning and managing the design and construction team. Ready to start your next project? Contact Z Modular and find out why we are The Only Way to Build®.